We have four different K53 eBooks available for sale. If you're not sure which one to use, please click here to see the differences between the books. The online test includes 255 questions covering road signs and markings, rules of the road and controls for your car or motorcycle. You can take the test up to 5 times online (you can't download and print the test). Improve your chances of passing your learner's licence the first time with The K53 Test App. The app includes 255 multiple-choice questions similar to those asked in the official learner's test. Questions are divided into three categories - vehicle controls, rules of the road and road signs - and are randomized each time you take the test. The app also allows you to review your answers and see whether you are prepared for the official test or whether you need to revise some more! The New Official K53 Manual is a comprehensive and effective guide to passing your Learner�s Licence and K53 Driver�s Licence � first time. Covering both light and heavy motor vehicles, and motorcycles, each chapter discusses the knowledge and skills expected of you. The learner�s section explains the K53 Defensive Driving principles, road signs and the rules of the road, with questions and detailed answers to test your knowledge. At the end of this section there is a test similar to that compiled by traffic departments. The driver�s section explains how candidates are tested and what examiners look out for, with step-by-step instructions on how to perform every manoeuvre in both the yard and road tests. With detailed, full-colour illustrations throughout, this is the definitive manual for both the learner's and driver�s tests. Hersien, met opgedateerde inligti ng en �n helder nuwe voorblad om daarby te pas, is Die Nuwe Amptelike K53-handleiding �n omvatt ende en koste-eff ekti ewe gids om jou te help slaag in die Leerling- en K53-Bestuurslisensietoetse. Elke hoofstuk bespreek wat van jou verwag sal word met die hantering van ligte en swaar motorvoertuie en motorfietse. Die Leerlinglisensie-afdeling verduidelik die K53-beginsels van defensiewe bestuur, padtekens en padre�ls, met vrae en antwoorde om jou kennis te toets. Aan die einde van di� afdeling is �n oefentoets, soortgelyk aan die een wat deur verkeersdepartemente opgestel word. �n Nuwe, nuttige afdeling wat addisionele items in die wetgewing opsom, is n� die toets bygevoeg. Die Bestuurslisensie-afdeling verduidelik hoe kandidate getoets word en waarna eksaminators oplet, met stap-vir-stap-instruksies vir elke maneuver in die werf- en die padtoets. Met detail-illustrasies in volkleur, is dit beslis di� gids vir leerling- en bestuurslisensietoetse. Di� handleiding se inhoud vorm ook die basis vir �n opsionele skakel tot �n aanlyn-selftoetsfasiliteit. I-K53 Esemthethweni Phasa ilenazi yakho kalula is the completely revised and updated Zulu edition of Pass Your Learner's Easily that you know so well. Pass Your Learner's Easily is a winning title, with over 2,000,000 copies sold. Because this all-time classic is so popular we have improved it without changing the winning formula. The text has been updated to include the latest information on the test. As you know, this title conforms to the Drivers K53 test and is an essential aid for anyone studying for their learner's licence. Pass Your Learner�s Easily is the essential manual for everyone studying for their learner's licence test. The authors are all professional trainers, and have devised this unique training method that will make passing the official test easy. This popular manual is the unchallenged, all-time classic for the learner's licence test, with 2 million copies sold to date. It has enjoyed the support of traffic departments countrywide for nearly two decades and contains the very latest information on the test. All the text is in easy-to-understand language and also includes over 200 simple, full-colour illustrations that make learning and remembering very easy. The test includes 187 test-yourself questions specially designed to reinforce the learning process and will help you pass your learner's licence test easily first time. Slaag Jou Leerlinglisensie Maklik is �n noodsaaklike gids vir enige iemand wat vir hul leerlinglisensietoets leer. Die outeurs is almal professionele instrukteurs en het hierdie unieke opleidingsmetode geskep om die slaag van die amptelike toets maklik te maak. Hierdie gewilde handleiding is die gewildste keuse vir die leerlinglisensietoets, met meer as 2 miljoen kopie� wat tot op hede verkoop is. Dit geniet die ondersteuning van verkeersdepartemente landswyd vir amper twee dekades en bevat die nuutste inligting vir die toets. Die teks is in maklik verstaanbare taal en bevat meer as 200 eenvoudige volkleur-illustrasies wat die leerproses en onthou vergemaklik. Die gids bevat 187 toets-jouself-vrae wat spesifiek ontwerp is om die leerproses te vergemaklik en jou te help om jou leerlinglisensietoets die eerste keer te slaag. 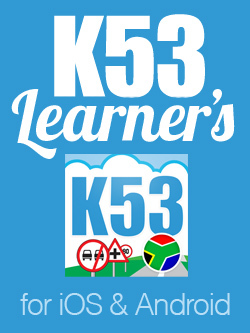 The Official K53 Pass Your Learner�s Licence First Time is a condensed reference at a budget price. It is based on the official K53 test, and contains all the information the learner needs to pass the test. The text has been updated to include the latest information that the learner will need to know to pass the test. Each requirement of the test is set out in a clear, easy-to-read style. As a learner driver, you are guided through all the information you need to master the rules of the road and traffic signs � everything you need to know to pass the test first time and at a budget price! Die Amptelike K53 Slaag Jou Leerlinglisensie � Eerste Keer is 'n opgesomde weergawe teen �n sakpas-prys. Dit is op die amptelike K53-toets gebaseer en bevat al die inligting wat �n leerlingbestuurder benodig om die toets te slaag. Elke vereiste vir die toets is in �n duidelike styl, wat maklik is om te lees, uiteengesit. As leerlingbestuurder sal jy alle verkeersre�ls en padtekens leer baasraak sodat jy die toets die eerste keer � boonop teen 'n sakpas-prys - sal kan slaag! This best-seller continues to provide novice drivers with a thorough grounding in everything they need to know to prepare for their learner's licence and K53 driving tests. The text has been revised and updated to take account of changes in road traffic legislation and the practical requirements for the official K53 Defensive Driving system. This well-presented, user-friendly book combines all the elements needed to pass the written tests, yard test and road tests for motor vehicles, motor cycles and heavy motor vehicles, and is the only manual that illustrates every rule of the road. Taken together, the text, illustrations and self-tests are designed to reinforce the learning process and make it easier to pass the learner's or driver's test first time. Hierdie topverkoper bied leerlingbestuurders weereens �n grondige kennis van alles wat hulle moet weet om hulle vir hul leerlinglisensie- en K53-bestuurstoetse voor te berei. Die teks is hersien en bygewerk om veranderinge in verkeerswetgewing en die praktiese vereistes vir die amptelike K53 Defensiefbestuurstelsel in te sluit. Hierdie goed uiteengesitte, gebruikersvriendelike boek kombineer al die elemente wat nodig is om die skriftelike toets, terreintoets en padtoets vir motorvoertuie, motorfietse en swaarvoertuie te slaag, en is die enigste handleiding wat al die padre�ls illustreer. Die teks, illustrasies en selftoetsing is as �n geheel ontwerp om die leerproses vas te l� en dit makliker te maak om jou leerlinglisensie- of rybewystoets die eerste keer te slaag. » How do I purchase/download the K53 eBooks from Penguin Random House's ebook store?